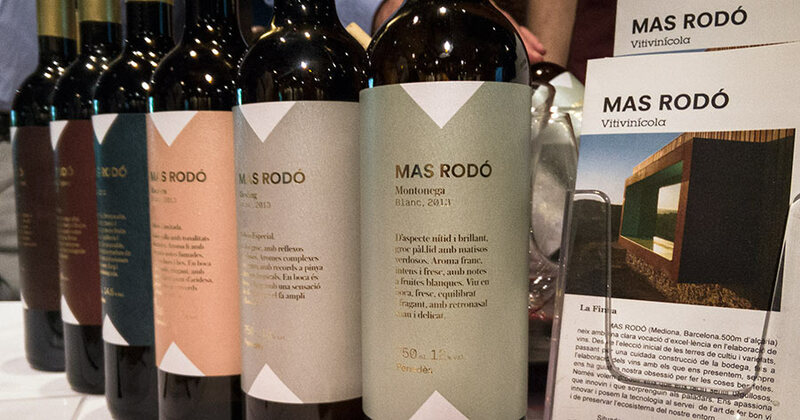 I recently attended a presentation of the new wines from DO Penedès as I’ve yet to figure out if this wine region in Catalonia (which is by far its largest) is also its best known or merely its more drunk. For me personally, I don’t often venture in to these wines as I prefer reds and whites are what Penedès tends to do best. That said, they can be found everywhere and so this tasting held at Mas Marroch seemed like ample opportunity to reacquaint myself. There were some 30 producers for this event which took place over just a couple of hours. Even in other regions where maybe 3-5 different wines are produced per cellar, it would be nearly impossible to taste everything in such a time frame. Penedès cellars, in addition to producing lots of wines, seem to enjoy having lots of labels in their collections and 10 or 12 different wines at each cellar weren’t unheard of. That said, I focused on just a few cellars as I was also constantly distracted by tasting Roca Brother snacks slipping out of the kitchen. Celler Credo is the still wine arm of Cava producer, Recaredo. They call themselves, “Xarel·lists” as they specialize a great deal in the grape, Xarel·lo. Overall, their wines are quite excellent representations of this grape and the Miranius 2013, Aloers 2013, Capficat 2013, and Ratpenat 2013 are all good options to put on the table. But what really impressed was the Estrany 2012. Aromatically rich with a well-structured body it stood out above the rest and is amusing as such given that the name means “strange” in Catalan. Coma Romà is an organic producer. Their Xarel·lo 2014 was fresh, clean, pleasing and naturally the longer-aged Xarel·lo Macerat 2013 was even more interesting and showed the possibilities of what’s possible with this grape. The Ull de Llebre 2014 and the Merlot 2013 however didn’t interest me and are typical of why reds from Penedès let me down. While not unpleasant, they are uninteresting, which is common of the other reds I tasted. Mas Rodó followed along similar lines. Their Macabeu 2013 and Riesling 2013 were very enjoyable, pleasing wines. Their Montonega 2013, which is a variant of the more well-known Parellada grape, was quite excellent lending a good deal of character and depth to its fresh, expressive aspects. Then of course there were the reds of the Cabernet Sauvignon 2010 and the Merlot 2011. They were both lacking in body and the Merlot, while decent was overtly tannin. If you were to taste the whites and reds blind, you wouldn’t know they were from the same winery given the massive style differences in them. Then lastly, it’s definitely worth mentioning the wines of Loxarel. A rather clever name for a winery in the region given that it’s an anagram of Xarel·lo. I’ll have to pay them a visit and do a full tasting of their wines in a more tranquil setting as this event didn’t allow proper notes to be made. In brief though, their Xarel·lo Amfores 2014 shows all the reasons why you age in amphora as it allows every nuance of this excellent grape to sally forth and be loved. Their 109 2004, while a DO Cava wine, is an experience. Aged for 109 months, thus the name, much like the Turó d’en Mota, this is a sparkling wine that shows what the region can indeed make. Naturally at 65€ a bottle it’s not for everyone, but what did you spend on that last good bottle of Champagne? In closing, while this was a scatter gun tasting that needs to be expanded upon, it shows that there are indeed good whites to be found in Penedès. The reds however still leave me scratching my head, even having done larger vertical tastings of other producers. While a strong thing to say, much like those in Priorat who are grafting Grenache on to their Cabernet Sauvignon vines, I feel like Penedès should just shift fully over to white wine production as it truly is what they do best.